During Thursday’s (14th April) debate in the House of Lords, it was clear that many of the peers there are well aware of the difficulties people had dealing with HS2 Ltd, Further, they are aware the Lords Select Committee would have to revisit many of the issues previously covered by the Commons HS2 Committee. With that in mind, we urge anyone thinking about submitting a petition to do so. The deadline is Monday 18th April. While the Euston area and the problems in London were brought up by many peers, issues in the Buckinghamshire and Warwickshire and elsewhere, along with ancient woodland were also raised. Lord MacGregor of Pulham Market spoke at length of the experiences of the Magic Circle near Euston, and other members of the Stephenson Way Group which includes the Royal College of General Practitioners, the Royal College of Ophthalmologists, the Royal Asiatic Society and the Methodist Church. Lord Berkeley was critical that the Commons group appeared “to have more or less given up, lost interest and taken everything that the promoters said or asserted without question”. “I want to concentrate on the process of using the Select Committee to give permissions. I was involved in the committees for the Channel Tunnel, HS1 and Crossrail, and I briefly chaired a Private Bill Committee on a Norfolk Broads Bill. One thing I learned is that committees must act in a judicial capacity when hearing petitions and listening to promoters’ responses. They must listen, and they do, certainly in your Lordships’ House. Having heard the petitions, the committee then forms a view on the issues. It may request further studies from the promoter and publishes reports. The major issues around Camden and the Euston area were brought up with a number of peers suggesting that the petting start at the London end. Lord Ahmad of Wimbledon, speaking for the government, suggested that they should be heard following the Summer Recess. There was some discussion as to whether the Select Committee could appoint their own technical advisors. Lord Ahmad of Wimbledon said that he would write to members about that, and Lord Berkeley’s motion that the Committee could appoint advisors was tabled. It’s not clear at the moment how that will play out, but if the government gets its way, the committee will not be able to appoint independent experts for advice and it will be up to petitioners provide evidence from “expert witnesses on the subject where they feel it necessary”. There was some discussion of whether Additional Provisions could be deposited: Lord Stevenson pointed out that with both Crossrail and the Channel Tunnel Rail Link, the Lords had considered Additional Provisions. NB The deadline for submitting petitions is Monday 18th April at 5pm. Please come along to a workshop for the 'larger than life' sculpture trail, a community arts event for 'Made in Burton Green' to celebrate our environment. This Saturday, April 16th, 10-3ish at 28 Hodgetts Lane. Pop in for all or drop in to collect materials to make at home. We have lots of materials that have been donated for this purpose, eg fabric, wire, card tubing and willow. Please feel free to bring your own materials to work with. There will be a meeting at the Village Hall, on Sunday 10th April at 7.30pm. If youare wondering whether you should petition the House of Lords please come along this Sunday. Link below if you would like to look at the details ahead or print. Petitioning the House of Lords ends 18 April 5pm for email [ payment and hand copy may follow after your electronic copy]. The process is simpler than the House of Commons. The main one being the documents may be emailed and money posted. It is a requirement that the "Prayer" (the last paragraph of the petition) and the signature appear on the same page of your petition. In other words the signature cannot appear on a page on its own. If necessary you will have to introduce more space before the prayer to achieve this. If you attempt to submit your petition without observing this requirement, you will be asked to change the layout before your petition will be accepted. There is also an HS2 information day in Kenilworth, 27th April 2-8pm Kenilworth Centre, Abbey End car park. The dates [18th June- 3rd July] coincide with Warwickshire Open Studios and we will have a page advert in the brochure for the event and we are part of the Coventry trail. The Scarecrows and Sculptures are remaining for a third week this year till 10th July. We have access to the Hall 7-9 pm Friday 24th June, and before the noon opening on Saturday. 25th, .for the exhibitors to set up, and to set up the café. 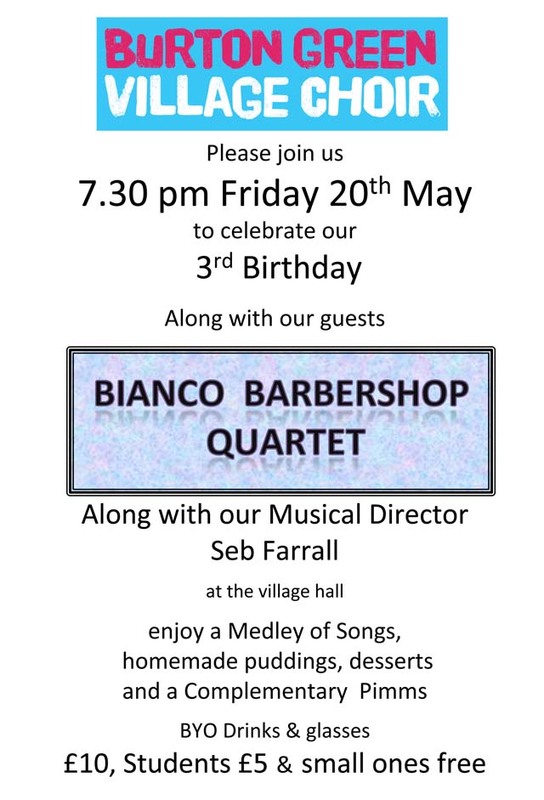 A small donation of £10 towards the cost of hiring of the Hall and a homemade cake for the café would be appreciated. Please let us know if you require a socket, large / small table or display screen. We can provide a white sheet for the table if you do not have one. 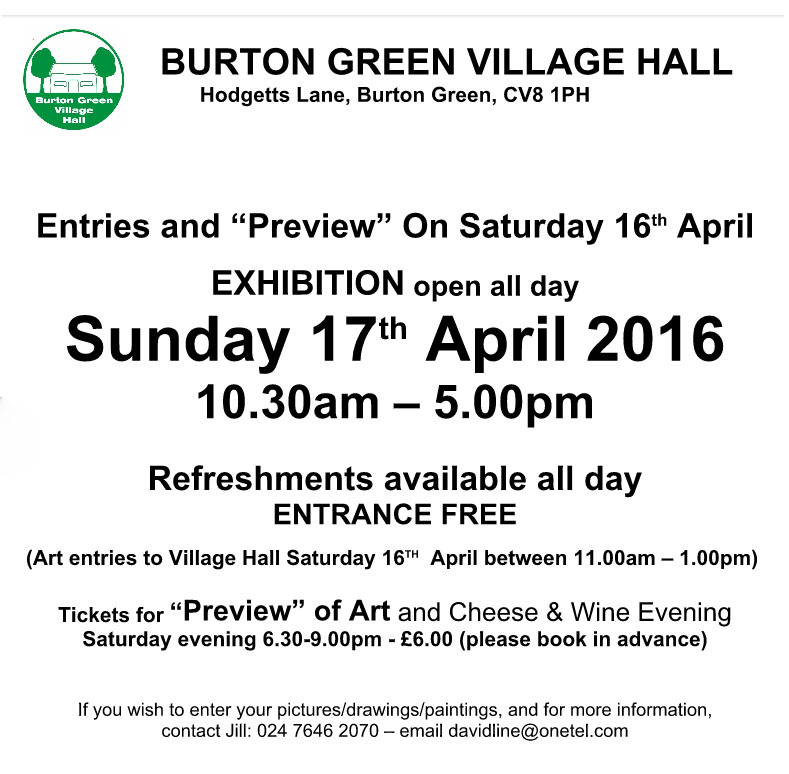 BG School will be exhibiting their art work too. Please let us know if you would like to Exhibit at the hall. Please let us know by 15th April. Sat.25th June 12 noon-5pm & Sun 26th June 10am-5pm. Exhibition, Sales and Demonstrations & vote for your favourite scarecrow. Café with cake & light lunches. Burton Green Village Choir 4pm Sun. 26th. Scarecrow results of competition after the Choir. In the National Grid Wood, Hodgetts Lane 18th June – 10th July. A circular trail to celebrate our environment. NB Scarecrow registration 10 am -12 noon, 18th June at VH open to all. Owners will then place their crows along the Greenway between Cromwell Lane Bridge and National Grid Wood entrance. Please mail for a scarecrow crib and ideas sheet. 10 am Sat.16th April at 28 Hodgetts Lane please a bring packed lunch. Or drop in to Stitch Group most Thursdays 7.30 -9.30 if you would like to assist. Open to all Dressing of the National Grid Wood will take place from 11th June. Sunday 10th July after 5pm by 5pm Monday 11th July. Sculptures will also be removed from the National Grid Wood. The event is being sponsored by BG Parish Council and BG Residents' Association. Volunteers for any part of the event extremely welcome.